This section demonstrates how to run a Fluid Structure Interaction (FSI) between CFX and ANSYS Mechanical on Rescale's ScaleX platform. The MFX Solver (Multi-Field Run) is used for FSI jobs by CFX. This example is based on an oscillating plate. A thin plate is anchored to the bottom of a closed cavity filled with fluid (air). An initial pressure of 100 Pa is applied to one side of the thin plate for 0.5 s to distort it. Once this pressure is released, the plate oscillates back and forth to regain its equilibrium, and the surrounding air dampens this oscillation. 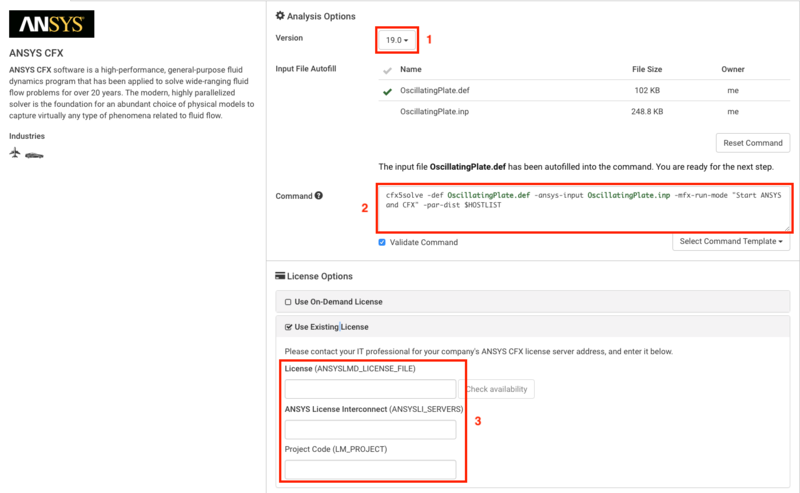 To obtain the files needed to follow this tutorial, click on the Job Setup link below and clone the job hosting the file. Next, click Save on the job to have a copy of the files in your Rescale cloud files. 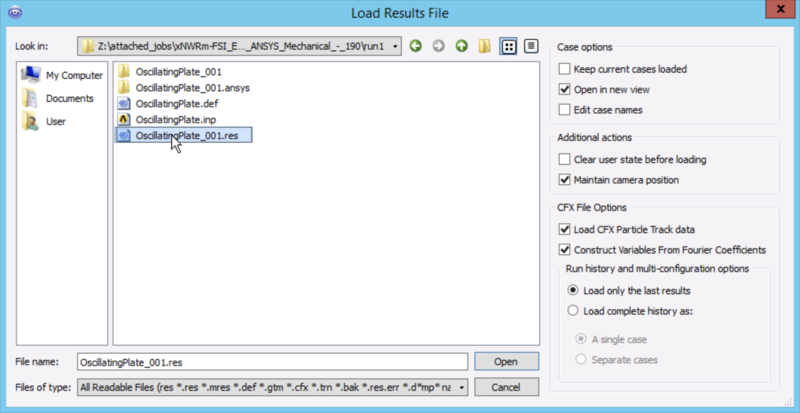 Please refer to ANSYS Documentation for creating these necesaary input files. After obtaining the necessary ANSYS Fluent files, we will now submit a Basic job on Rescale. For more information on launching a basic job, please refer to the tutorial here. On the Rescale plaftorm, click on + New Job on the top left. Name your job and make sure the Job Type is set to Basic. 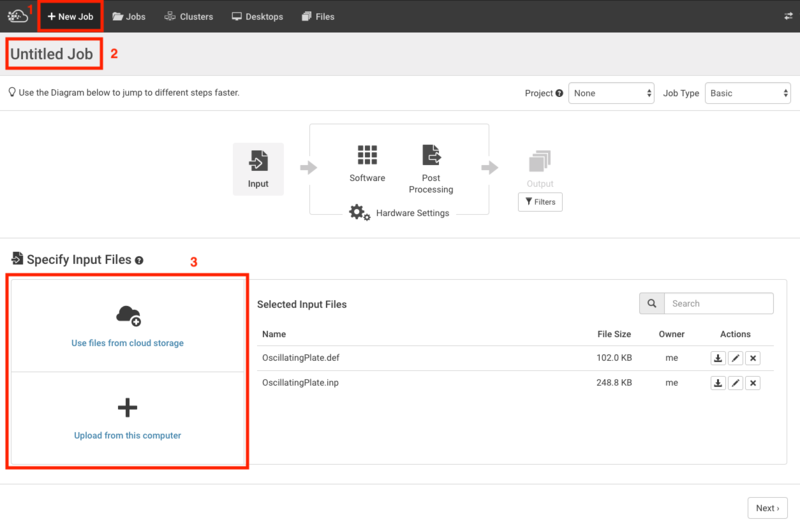 Next, upload the input files (.def and .inp) using either the Use files from cloud storage button if the files are stored on Rescale's cloud storage or the Upload from this computer button if the files are located on your local workstation. Click Next to move onto the Software Settings section of the setup. 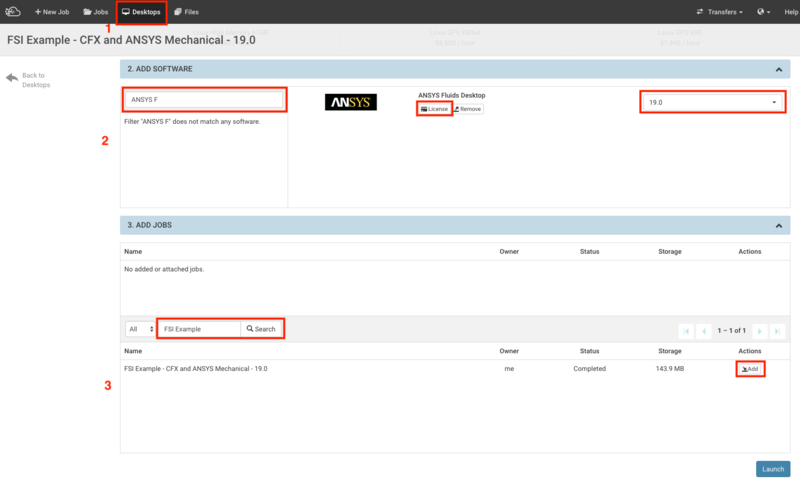 Under Select Software, search for ANSYS CFX and click on the software icon. The -def flag is followed by the CFX input file (.def) and the -ansys-input flag is followed by the mechanical input files (.inp). The -mfx-run-mode "Start ANSYS and CFX" starts the Multi-Field run by starting both the CFX Solver and the ANSYS Mechanical Solver. In the above command line, the -ansys-argumenst "-np 4" tells the ANSYS Mechanical solver to use 4 partitions. Under License Options, select the appropriate license type and fill in all the relevant fields with your license details. Under Hardware Settings select the appropriate coretype and the number of cores. For this tutorial, we select Onyx as the coretype and request 8 cores. A summary of your hardware information is available on the right side of the platform page. After reviewing your job setup, you can submit the job by clicking on the blue Submit icon on the top right corner and on the Job Summary page. After you submit the job, the Status page opens on the platform. Here, you will be able to monitor the job progress in a gantt chart like format, see a date and time stamped log and live-tail the status and output of your job using the Live-tail window. A guide on Monitoring Status on Rescale is found here. Go to the results page of the completed job and select the Download Job icon as shown to download all the result files. If you wish to download only a few specific files, you can select the files and click on Actions > Download selected files. Rescale will zip all the results files. To view the results on CFD-Post, launch the application and click on File > Load Results.... Navigate to the location where you saved the result files and open the .res file to view the results. 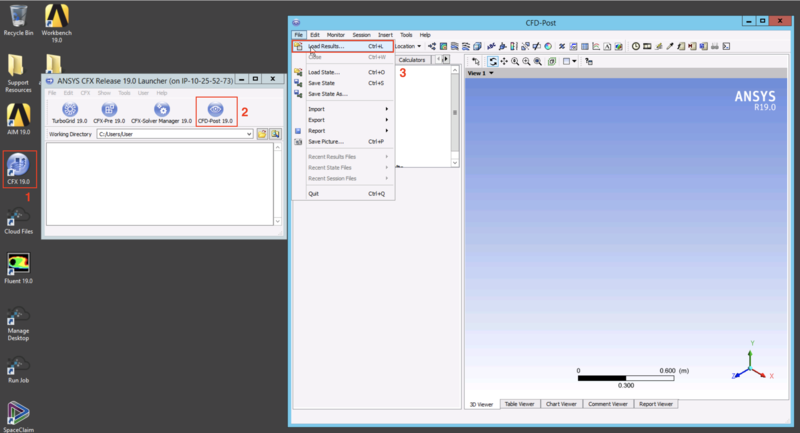 Once the Desktop session is started, click on the CFX Launcher icon on the desktop and launch CFD-Post. To view the results on CFD-Post, launch the application and click on File > Load Results.... Navigate to Desktop > attached_jobs > [Job_Folder] > run1 and open the .res file to view the results.